How To Make Homemade Box Mix Brownies - BEST Brownie Recipe! Homemade brownies made easy today! 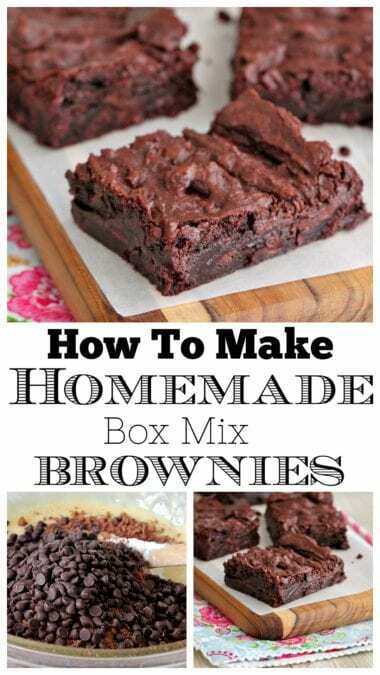 Sharing my favorite brownie recipe, How To Make Homemade Box Mix Brownies! 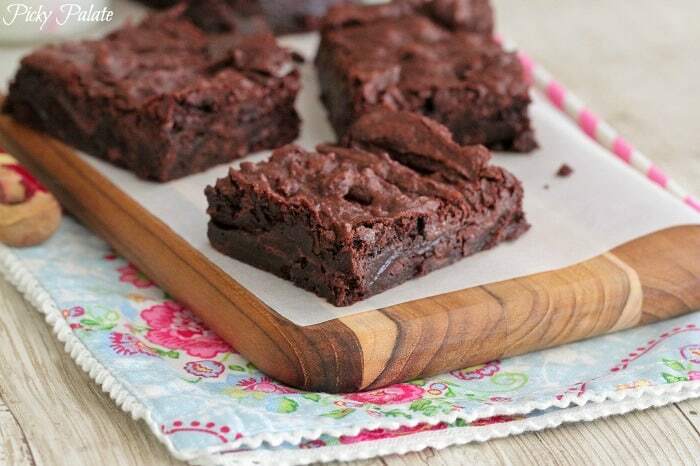 Perfect fudgy brownies! Doesn’t get better than homemade brownies. I’ve been playing around in the kitchen and have developed this recipe that is pretty darn close to the beloved box mix brownie. I tested them at room temperature and chilled. Both equally amazing. They are literally just right in every aspect! Hope you enjoy! Be sure to follow Picky Palate on Instagram for sneak peeks on what’s coming next to the blog! Here’s what you’ll need to whip up a batch of your own. I used mini chocolate chips, but use your favorite chocolate chip. Up front in the glass bowls is flour, salt and sugar. 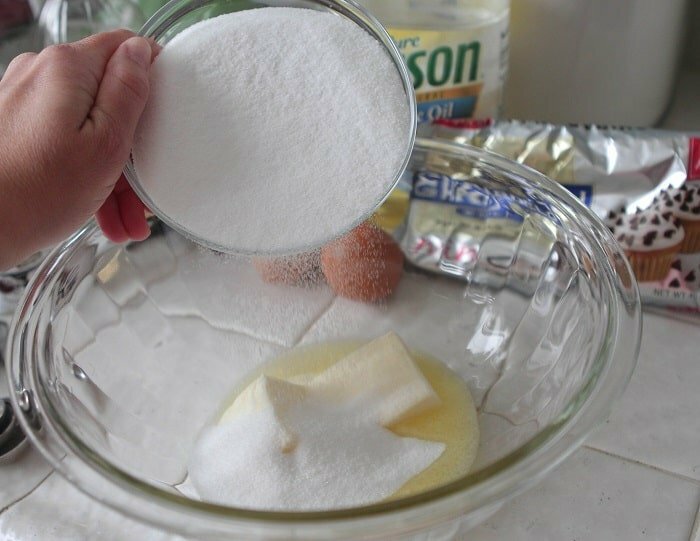 Start by adding partially melted butter and sugar to a large mixing bowl. Add just a touch of vegetable oil and a splash of vanilla. Add 2 large eggs and mix until combined. 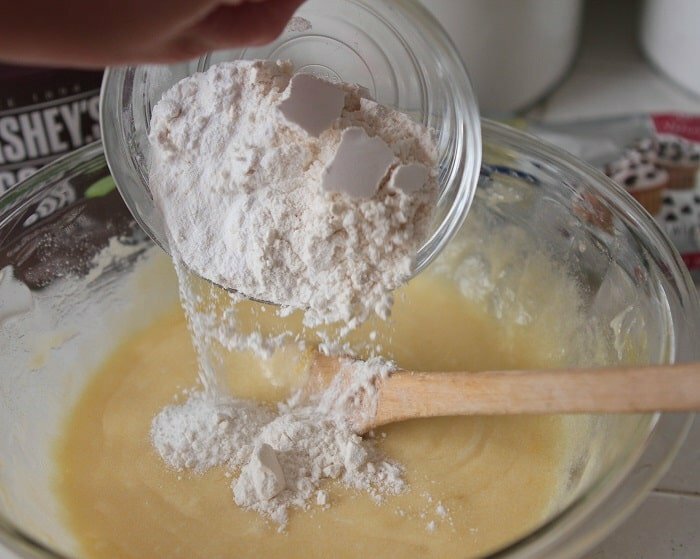 Time for the dry ingredients….flour, salt and baking powder. I had to refrain myself from licking this bowl clean. 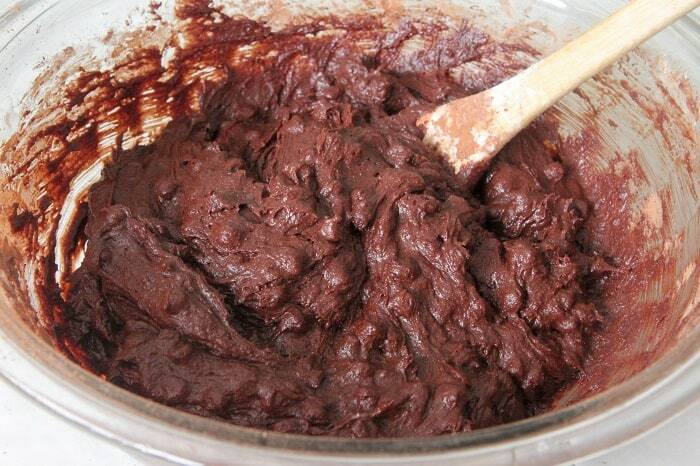 Best brownie batter ever! Pour your batter into a parchment lined 8×11 inch baking dish. You can use a 9×13 inch but they’ll be much more thin and you’ll have to adjust your baking time. Same with a 8×8 inch. Thicker brownies and longer baking time. I find that this size pan was just right. What’s The Best Type of Pan For Baking Brownies? Light colored aluminum pans are my favorite for baking brownies. They heat up quickly without overheating, and then cools down quickly once removed from the oven. Glass (such as Pyrex) and ceramic have poor heat conduction. I’ve used plenty of my pyrex pans for baking brownies, but I try to stick to my lighter aluminum non-stick pans. Dark colored aluminum pans are a very common material. It work just fine for baking brownies, but since dark colors absorb more heat than light colors, keep a close eye on your brownies to prevent over baking. Edge Brownie Pans have become very popular. It’s the pan that gives you an edge brownie piece with every square. It’s a light aluminum pan, so I’m a fan! Find them at most Walmart and Target stores. Amazon is also a great place to find them. Once they cool, cut into squares and sink your teeth right in 🙂 Enjoy! Preheat oven to 325 degrees F. and line a 8x11 inch baking dish with parchment paper sprayed with cooking spray. 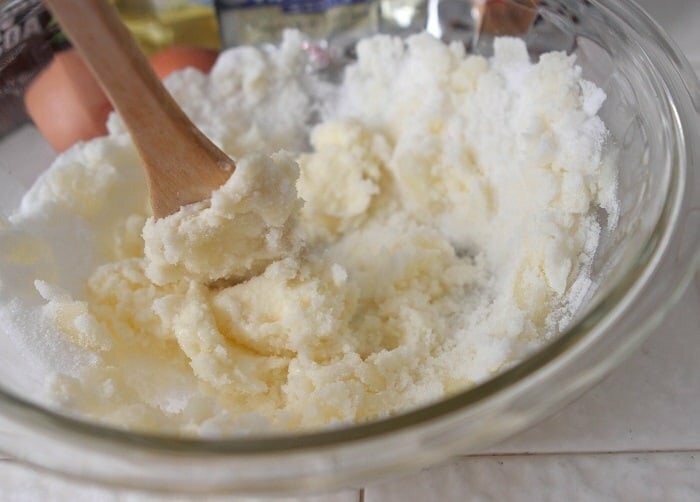 Place butter into a large mixing bowl and microwave until partially melted. Add sugar and oil, mix until well combined. 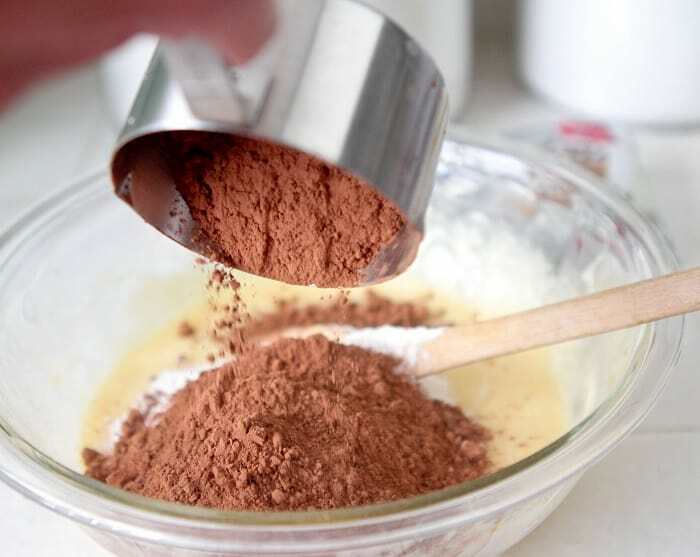 Stir in eggs and vanilla stirring until combined then add flour, cocoa powder, salt, baking powder and chocolate chips. Stir until combined and thick. Transfer batter to prepared baking dish, spreading evenly. Bake for 35-40 minutes, until baked through. Remove and let cool completely, about an hour. Lift parchment and brownies out of pan and cut into squares to serve. You Scream I Scream We All Scream For Ice Cream….in our desserts! Jenny it looks like you nailed them! They’re gorgeous! Recently I cheated on my 5 year old brownie recipe that was a melted choc recipe, with one that uses cocoa powder and I love it. I bet I would love yours too! Pinning! Jenny, Wow!!! What a genius Idea!! These look perfect in every way. I NEED to make these. Maybe even today since it is crazy snowing and I am not leaving the house! 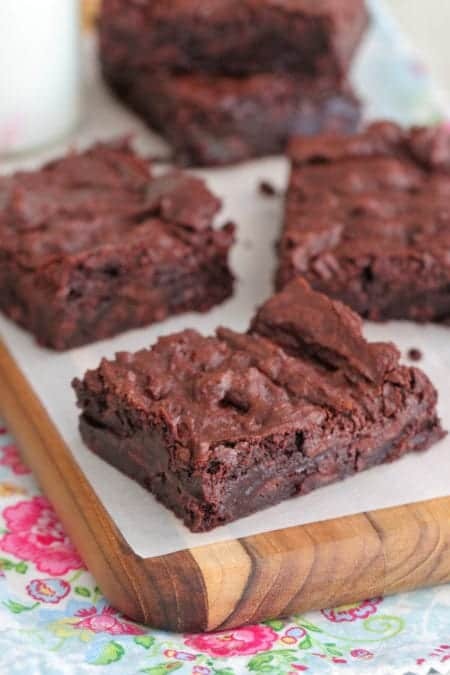 Love chewy brownies…these look amazing Jenny! I love trying different scratch brownie recipes, and no matter how tasty they are, my husband still has a soft spot for the box! This is a great recipe for us. They look like big slices of fudge-a-licious heaven! WHat a great recipe! I’ll totally be trying these! I like my brownies gooey– can’t wait to try this fabulous recipe, Jenny! These look perfect! Love the crackly top! When do you add oil? Looks great! Oh so decadent looking…you did not specify the type of Cocoa Power, but will try w/ Extra Dark which is my favorite. Thanks for the post! You left out the oil in the directions. Making these right now. Just edited the directions thanks! This is a bookmark FOR SURE!! they look totally incredible! Ooo I’ve got to try these! Right away. These look delish but since I am elminating PUFA from our home, I will be using virgin coconut oil instead of the vegetable oil in your recipe. Thanks for the recipe. Homemade brownies are so easy and always welcome! Love the homemade version of a box mix!! It looks so chocolatey and fudgey good!! I would replace the GMO soybean oil with coconut oil. Veg oil is a rancid oil that causes inflammation in the body. Never use Veg oil made from Corn, Canola or Soybeans. I’ll take two…or ten, please! these seriously look amazing!! thanks for sharing Jenny! 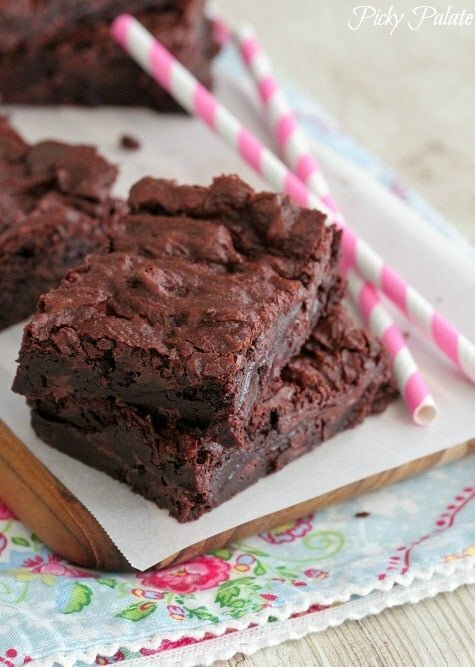 These do look amazing, and they’re not much more difficult than boxed brownies anyways! Pinned, and definitely trying soon. Totally drooling over here! These brownies look amazing, Jenny! These seriously look like absolute perfection!!! I usually don’t bother with homemade brownies because I do like the box mix so much! Is that bad? lol. But these look fudgy and delicious – I’m not a fan of cakey brownies. And they’re so easy! I have all of these ingredients right now. Thanks! Oh my goodness!! Just made and ate these!! They are so good, thank you thank you! Never buying box mix again. Very yummy! omg. so into this. 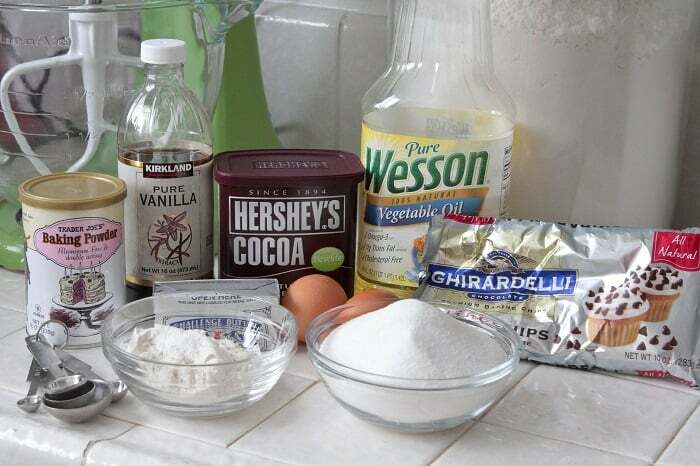 I hear a new batch of slutty brownies with this recipe calling my name! Oh how I wish it was my job to make and eat brownies. These look brilliant. Can’t wait to try them. These look so dense and fudgy! I have to try them! My brother always says my brownies will never come out like box mix but I’m thinking he’ll change his mind after I use this recipe! The pictures are only a hint of how tasty these are! Just now making this recipe and let me tell you, I was liking the batter right off my fingers before popping the dish into the oven! Love! They are perfect!! Made them and everybody loved them! 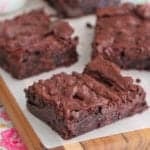 Definitely one of my favorite brownie recipes!! Oh Jenny…you just made this pregnant woman VERY happy! 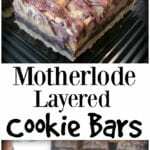 I will be making these for my kiddos tonight! Yay! Let me know how you like it Jennifer! Oh yay! I (we haha), can’t wait to try these!! “Best Brownie Batter Ever” is the reason to ALWAYS make homemade brownies–licking the bowl. Brownie mix batter tastes horrible, but the homemade batter is SO good. Makes me want to go make some now, just to eat the batter. Plus, it really is just as easy as a box mix. I’ve made homemade ones so often, I can do it really fast, and without a recipe too. So I was skeptical, because I have never tried from scratch brownies (for love of the box variety! ), but WOW these are great! For an event this evening I actually made a box mix (I’m a Duncan Hines chocolate fudge girl! )and also this recipe….Not only did the appearance blow the box mix out of the water the taste was incredible! These are super fast, easy, and I LIKE THEM MORE THAN MY DUNCAN HINES! Another great recipe, Jenny–thank you much! I just made these and they’re almost exactly what I’ve been looking for! The texture is perfect, which is what the other recipes I’ve tried have been missing. Hello! I’m a baker in AZ and made these brownies this morning. I cooked them for 35 min, and they had a great flavor but were definitely overcooked :/ I think they probably would’ve cooked in 25-30 minutes. Made these tonight! I’ve never made from-scratch brownies before because I’ve never been crazy about them when others have made them (it’s hard to replicate that box mix taste!). 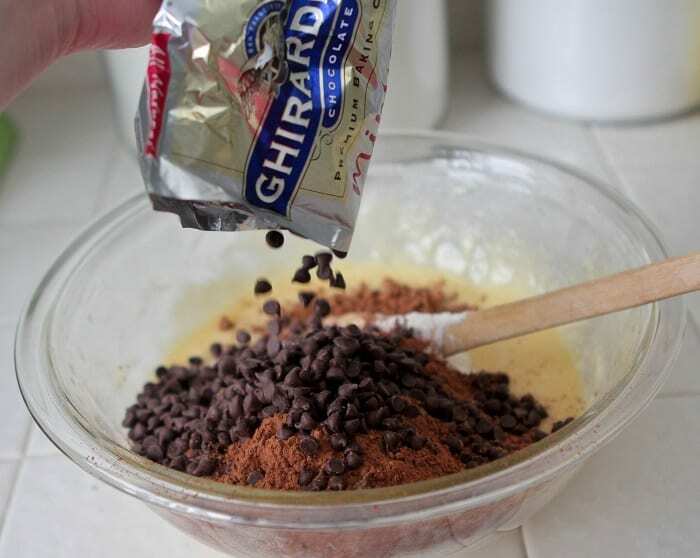 These brownies are super delicious though, and they don’t take much more time than a box mix. I used a 9×13 pan because it was that or an 8×8, and I wanted more brownies! (I always use the 8×8 for box brownies so they’re super thick and decadent). I baked them for 30 minutes and they came out perfect — a slightly gooey inside and a crisp top crust. And, licking the bowl was an added bonus! So happy to hear it Jillian! Thanks for sharing!